Recipes the define the resources to use and the order in which to apply them. Extensions to Chef including custom resources and libraries. Use semantic versioning when numbering cookbooks. This versioning can be found in the metadata.rb file of the cookbook. Additional lables for pre-release and build metadata are available as extensions to the MAJOR.MINOR.PATCH format. Only upload stable cookbooks from master. Only upload unstable cookbooks to your own fork. Merge to master and bump the version when stable. Never ever decrement the version of a cookbook! Chef-client will always use the highest-numbered cookbook that is available after considering all constraints. If Chef Server knows about a cookbook with a higher number than the one you just uploaded, then your code is not going to get run. Do not add a version constraint in your test environment to work around this; it will definitely bite you later on. Your build system should fail the build if the cookbook version has not been incremented beyond the last uploaded cookbook. This matters even more if you're publishing to Supermarket. Bug fixes not affecting the code increment the patch version, backwards compatible additions/changes increment the minor version, and backwards incompatible changes increment the major version. This system is called "Semantic Versioning." Under this scheme, version numbers and the way they change convey meaning about the underlying code and what has been modified from one version to the next. Major version zero (0.y.z) is for initial development. Anything may change at any time. This public cookbook should not be considered stable. Minor version Y (x.Y.z | x ; 0) MUST be incremented if new, backwards compatible functionality is introduced to the public API. It MUST be incremented if any public API functionality is marked as deprecated. It MAY be incremented if substantial new functionality or improvements are introduced within the private code. It MAY include patch level changes. Patch version MUST be reset to 0 when minor version is incremented. Major version X (X.y.z | X ; 0) MUST be incremented if any backwards incompatible changes are introduced to the public API. It MAY include minor and patch level changes. Patch and minor version MUST be reset to 0 when major version is incremented. Precedence refers to how versions are compared to each other when ordered. Precedence MUST be calculated by separating the version into major, minor, patch and pre-release identifiers in that order (Build metadata does not figure into precedence). Precedence is determined by the first difference when comparing each of these identifiers from left to right as follows: Major, minor, and patch versions are always compared numerically. Example: 1.0.0, 2.0.0, 2.1.0, 2.1.1. When major, minor, and patch are equal, a pre-release version has lower precedence than a normal version. How Should I deal with revisions in the 0.y.z initial development phase? The simplest thing to do is start your initial development release at 0.1.0 and then increment the minor version for each subsequent release. How do I know when to release to 1.0.0? If your software is being used in production, it should probably already be 1.0.0. If you have a stable cookbook on which users have come to depend, you should be 1.0.0. If you’re worrying a lot about backwards compatibility, you should probably already be 1.0.0. If even the tiniest backwards incompatible changes to the public cookbook require a major version bump, won't I end up at version 42.0.0 very rapidly? This is a question of responsible development and foresight. Incompatible changes should not be introduced lightly to software that has a lot of dependent code. The cost that must be incurred to upgrade can be significant. Having to bump major versions to release incompatible changes means you’ll think through the impact of your changes, and evaluate the cost/benefit ratio involved. What do I do if I accidentally release a backwards incompatible changes as a minor version? As soon as you realize that you’ve broken the Semantic Versioning spec, fix the problem and release a new minor version that corrects the problem and restores backwards compatibility. Even under this circumstance, it is unacceptable to modify versioned releases. If it’s appropriate, document the offending version and inform your users of the problem so that they are aware of the offending version. Part of what makes chef tooling so powerful is its ability to test your product quickly and easily over a variety of different platforms. Using recipes and test-kitchen, a chef user can call on a variety of different drivers to push their cookbooks to EC2 instances, docker containers, VSphere and Azure instances in a matter of moments. If a driver exists for the platform, test-kitchen can be used for "local" deployment. 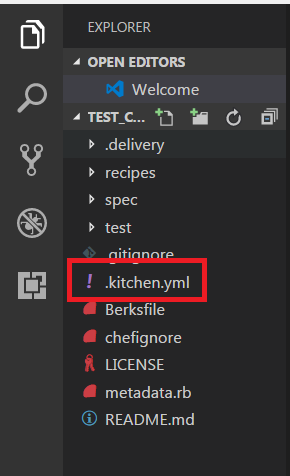 kitchen-all A driver for everything, or “all the drivers in a single Ruby gem”. kitchen-bluebox A driver for Blue Box. kitchen-cloudstack A driver for CloudStack. kitchen-digitalocean A driver for DigitalOcean. kitchen-docker A driver for Docker. kitchen-dsc A driver for Windows PowerShell Desired State Configuration (DSC). kitchen-ec2 A driver for Amazon EC2. kitchen-fog A driver for Fog, a Ruby gem for interacting with various cloud providers. kitchen-google A driver for Google Compute Engine. kitchen-hyperv A driver for Hyper-V Server. kitchen-joyent A driver for Joyent. kitchen-linode A driver for Linode. kitchen-opennebula A driver for OpenNebula. kitchen-openstack A driver for OpenStack. kitchen-pester A driver for Pester, a testing framework for Microsoft Windows. kitchen-rackspace A driver for Rackspace. kitchen-terraform A driver for Terraform. kitchen-vagrant A driver for Vagrant. The default driver packaged with the Chef development kit. This list is pulled directly from Chef's Kitchen docs page. Other drivers can also be found in the open community including kitchen-cloudformation which was used to some success for a recent project that my company worked on. In order to begin using test-kitchen you must install chefdk. This will not be covered here but I discussed these steps earlier in a previous blog post here. The kitchen-ec2 driver is installed with ChefDK by default and so no further work will be needed to setup the ec2 kitchen driver. An AWS account will also be required to launch instances. 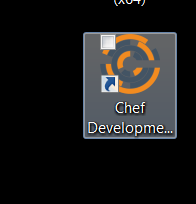 First start by opening your Chef Development tools by double clicking on the link. Next, we will need to create a cookbook to run test kitchen on. 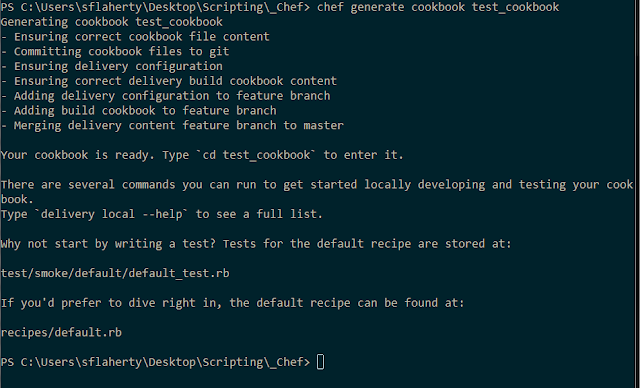 We can do this by running the command chef generate cookbook [cookbook_name] . I will name this cookbook test_cookbook to keep it descriptive. When this command runs successfully you will see a number of things returned, including a section which says "Your cookbook is ready. Type 'cd [cookbook_name]' to enter it"
Since actually designing these cookbooks is out of scope for now all we are really interested in is the kitchen.yml file. This file is what will give our cookbook the information needed to spin up our instance through test-kitchen. 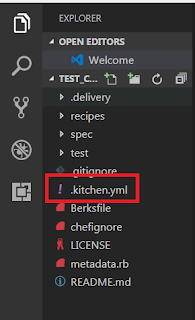 Using your favorite editor (we will be using visual studio code for this demo, which can be downloaded here) open the new cookbook that you just created. As we can see in the explorer window there are a great number of files and directories from which to choose from. We will discuss these in a later blog post. What we are most worried about now is the kitchen.yml file. The kitchen.yml contains a number of different components and will provide a great deal of control when spinning up our instances. We are currently using the EC2 driver. It's full documentation can be found here. Since this is just a guide to get us started lets look at four specific locations; driver, transport, platform and suites. Lets walk through the components. name is the name of the driver that we are going to use to spin up our instance. In this case, as explained earlier, we will use the ec2 kitchen driver. This driver uses the aws sdk gem to provision and destroy EC2 instances. aws_ssh_key_id is The ID of the AWS key pair you want to use. The default will be read from the AWS_SSH_KEY_ID environment variable if set, or nil otherwise. 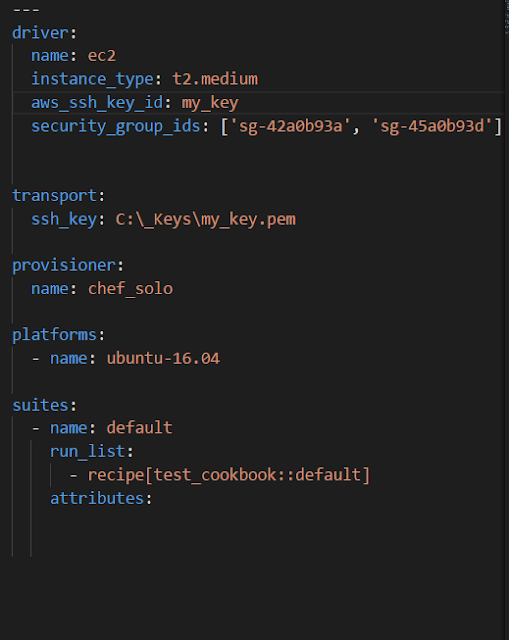 If aws_ssh_key_id is specified, it must be one of the KeyName values shown by the AWS CLI: aws ec2 describe-key-pairs. Otherwise, if not specified, you must either have a user pre-provisioned on the AMI, or provision the user using user_data. This all gets very technical but luckily there are some good instructions on how to pull down these keys here. security_group_ids these are an Array of EC2 security groups which will be applied to the instance. The default is ["default"]. name is the way to specify the image you are wanting to run on your instance. name the name of the suite that we are going to run. run_list what we want run on the instance when it is up and running. All together our kitchen.yml will look something like this. This .yml says we want to provision a ubuntu-16.04 server on a t2.medium instance. We will use the key my_key as our aws ssh key to provision the instance. This key will also be used to ssh into the instance once it is provisioned. The instance will have two security groups included (As part of an array), thus the , and will run the default recipe for our cookbook. 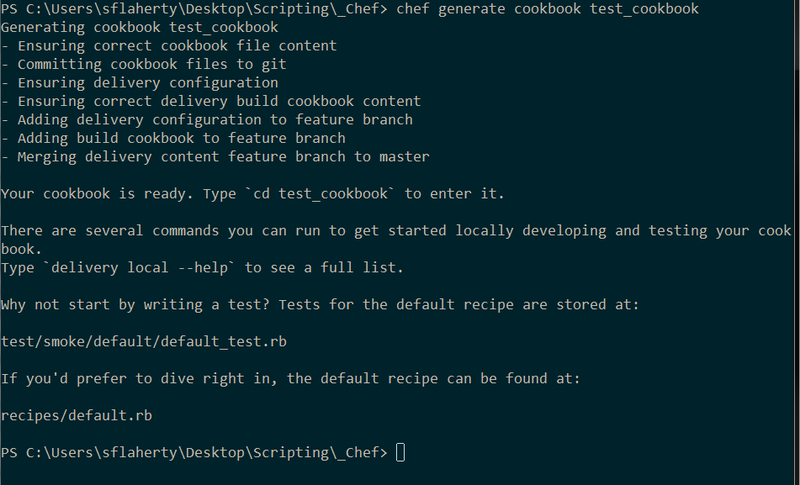 Since our cookbook default recipe is completely empty this will be a relatively boring test but we will run it anyway just to get a feel for what test-kitchen will do. First we will launch chefDK again if we have closed it by going to the icon. Navigate to the root folder of our project. For this case it was test_cookbook, yours may differ. Next we will run berks install this will download any cookbook dependencies that we might need to get our current cookbook to run. While we are not layering or wrapping any cookbooks currently, this is a good habit to get into so you don't run into problems in the future. NOTE: If you have already run berks install on a cookbook you will run berks upgrade from that point on. Berks install is only for the initial run. Unfortunately, my connection was not being friendly when this was written, but berks did complete. Next we will actually run test-kitchen. From your command line run kitchen converge. This command will spin up the instance and then install your cookbook on top of it. After everything is deployed and setup you should get the return "Kitchen is finished" letting you know that everything deployed successfully. Once in our instance we can make any changes necessary and verify our instance. Type exit to get back out. Finally, to destroy the instance we will type kitchen destroy. This is just the very beginning steps of what can be done with kitchen. Test kitchen is a powerful tool for testing cookbooks locally before pushing into staging or production boxes. As described in the pull quote above the benefit of Chef is that everyone from infrastructure engineer to developer will write their product through code which can be version controlled and deployed on both your internal (on-premise) and external (cloud) solutions. It's a very powerful tool with huge ramifications for fledgling or aging organizations. 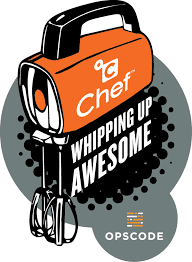 Before we get to deep into the woods on Chef, the philosophy of infrastructure through code, and all the tools chef opens up to an organization, lets first touch on the installation of the chef developer tools which will henceforth be referred to as ChefDK. Unfortunately, or fortunately, I work in a windows based shop so the following instruction set will be designed specifically with the Microsoft OS in mind. The following documentation is written to the current state of the chef system at time of writing. Since Chef at its base is an open source solution it is constantly changing with product need. Since I am in love with CLI commands and Powershell I avoid the installation guide provided by chef at their website. While these instructions work fantastically well I like to script the great majority of my installations so I can call upon them in the future. And that's it after the script has completed its run, chocolately will have been installed on your local machine. From the top right hand corner of https://chocolatey.org/ select "Packages"
In the "Search Packages" box type Chef. We are looking for the Chef Development Kit which is the first selection presented. As we can see in the image above, the chocolately command that we need to run to install this package is choco install chefdk. From our powershell window, still running in administrator mode, type the above command. After being prompted whether you wish for the package to be installed, you do by the way (hit Y for yes), ChefDK will now be installed for you through the chocolately tool. With the chocolately package installed you can quickly upgrade you chefdk installation in the future with choco upgrade chefdk or easily remove the package with choco uninstall chefdk.